Meetings held the 2nd Wednesday of each month and feature guest speakers and an opportunity to network with other member businesses. A networking table is provided to allow members to put out materials. Rotating between breakfast and after hours events held when they are scheduled by a local member's business. Your business listed on the Website Directory. Members can also enhance their listing to include logo, business description, map directions, job postings, hot deals, and even photos. Published weekly. For a small fee, members can sponsor the e-newsletter. This also allows members to highlight their business at the monthly membership meeting. 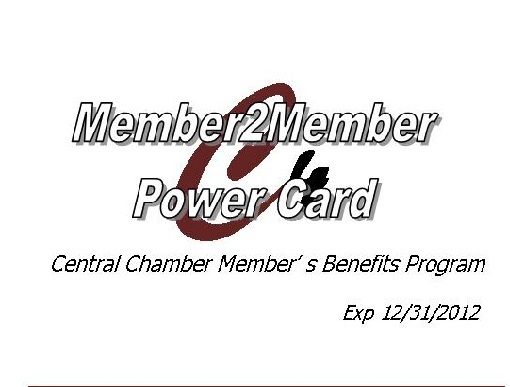 Discounts provided to our members through our Member2Member C4 Power cards, the Office Depot Card, and Constant Contact. Click here for Member2Member Application. A select committee of volunteer professionals who support the development and growth of the Chamber by enhancing public relations and communication endeavors, and serving as business liaisons to members of the City of Central Chamber of Commerce. The following committees allow members to help promote events, work along side other chamber members, and improve their committee skills: Mardi Gras Ball, Awards Banquet, Chamber Golf Scramble, Christmas Festival and Parade, and Membership Development. The chamber provides ribbon, a plaque with a picture to commemorate the event, and a photo in the paper. This is done for our members free of charge.